Come out and celebrate the Earth, our home on Saturday, April 22! 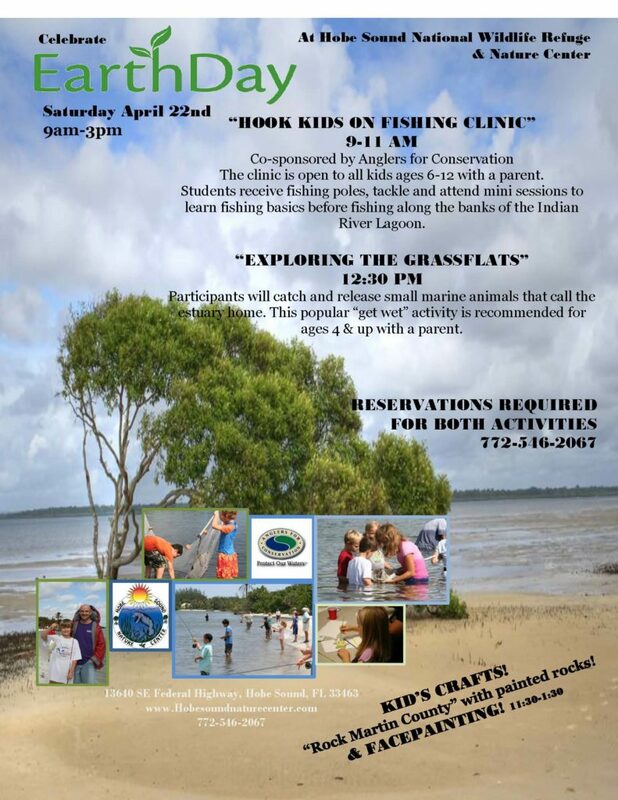 Scheduled activities include our annual “Hook Kids on Fishing Clinic,” co-sponsored by Anglers for Conservation from 9-11 a.m. The clinic is open to all kids ages 6-12 with a parent and reservations are required. Students receive fishing poles, tackle and attend mini-sessions to learn fishing basics from local experts. Their newly acquired skills are then put to good use by fishing along the banks of the Indian River Lagoon. Reservation Required. During the afternoon starting at 12:30 p.m., Explore the Seagrasses” with hand nets and seine. Participants will catch and release small marine animals that call the estuary home. This popular get wet activity is recommended for ages 4 and up. Reservations Required. Join us for face painting and stained glass crafts All Day! Come Rock Earth Day and Martin County by making your own hand crafted rocks. The Center’s exhibits and gift shop will also be open all day for this free event. Contact us for reservations and details! Call (772) 546-2067 or Book a Reservation Online at www.hobesoundnature.com. The Hobe Sound Nature Center is a private, non-profit organization, located at the Hobe Sound National Wildlife Refuge, 13640 SE Federal Highway, Hobe Sound.